Summer is by far one of my favorite times of the year. The sun stays out longer, there is more flexibility in our schedule, and I can actually drink my coffee. And by drink my coffee, I mean I don’t have to chug the scalding liquid on my way out the door. I start anticipating the summer months right after Spring Break has come and gone. I can’t help it, by this time I’m just over the monotonous nature of the school year. I want my freedom as much, if not more, than my kids. However just because I love the summer months with the kids doesn’t mean it doesn’t come with it’s own unique struggles. For example, as I write this post my kids are arguing with each other over their Magna Tiles. They are arguing after my youngest begged her sister to play with her. They are huffing and puffing at each other, and I’ve already had to go out and discipline them no less than 4 times. It’s the best of times and the worst of times. 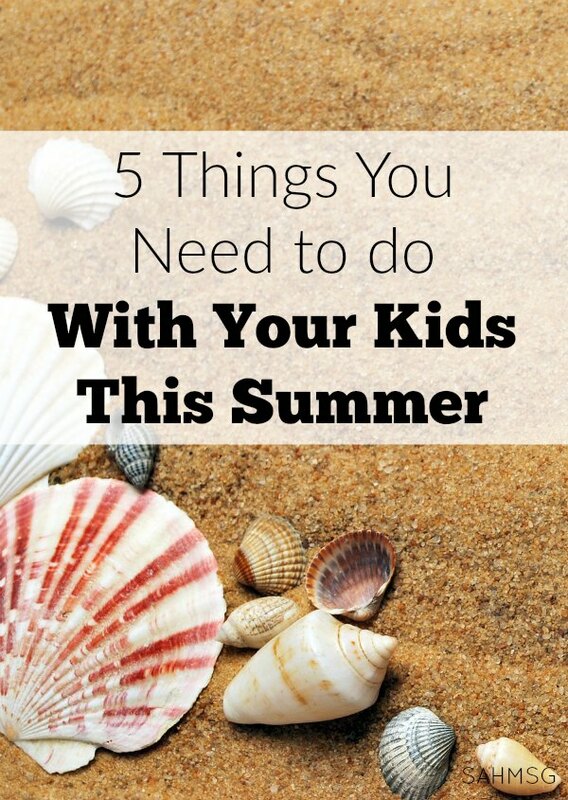 Since I know how tricky it can be to navigate through the summer months I’ve come up with 5 things you need to do with your kids this summer. We’ve done a few of them previously and others we’re trying out for the first time this summer. We started doing this three years ago and it is awesome. We bought a giant posterboard and fun markers and pens. Then we picked a night everyone was home to sit around the kitchen table and discuss what each member of the family wanted to do individually during the summer and also what we wanted to do together as a family. We hung it up in the kitchen so it was a daily reminder of the things we wanted to do. I tend to like to hide things away by organizing them, but keeping it out in the open is key to it’s success. This also helped with the “I’m bored” sentiments. I would simply look at the list and see if there was something on there we could do or something that my kids could do on their own. It was not only fun to create the list and then do things from it, but it was fun to see just how many things we were able to check off and do as a family. I know sometimes we get so busy that we didn’t even realize just how many things we had checked off during the summer. 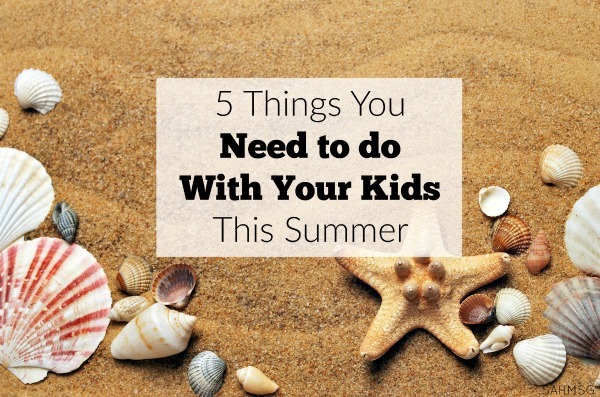 This year I’ve made a huge effort to have a laid back summer with my kids. In the past, I’ve worked too much or we’ve over scheduled activities which just brought stress. Stress that we didn’t need. So this year I’ve advocated for taking strides to have a summer that has more freedom, less rules and more fun. This year I’m concentrating on incorporating more fun activities and less things we don’t want to do. Going to the beach and simply enjoying being there without worrying about to-do lists or the other million things I have to do. Because the truth is they will still be there waiting for me. For me having a laid back summer is simply an opportunity to live a simpler and more conscious life. 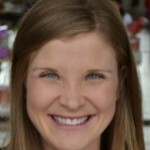 Let’s face it, most of the activities during the summer months for kids and families can be quite pricey. If you want to go the amusement park, water park or even a museum the prices alone can make doing these activities few and far between. Finding activities for kids and the family that are free or cheap is key to a successful and fun summer. I used to think it was next to impossible to find free or cheap activities locally, but the more I’ve scoured the more I’ve been able to find. For example, in our town you can go to the Naval Air Museum with the kids completely free. There’s also a STEM learning center that does a discounted family rate for the year meaning it’s cheaper to get a membership and pay only dollars each month. Obviously this is only good if you expect to use the membership a lot. Be on the lookout for free and cheap activities in your area. I promise they’re out there and with a little bit of searching you’ll be able to add these to your family’s summer bucket list. If you do the math we only get 18 summers with our kids before they’re out of our house. That’s roughly 54 months of summer times activities, and that’s not counting when they’re teenagers and won’t want to hang out with us. That’s why I think it’s so important to do at least one thing each summer that you’ve always wanted to do. It can be anything, big or small. It can be something as a small as camping in the backyard or having a movie marathon day. It can be something as big as a 2 week family trip going to the Grand Canyon. Whatever your dreams make sure you do at least one thing with your kids during each summer. Summers sometimes feel like they’re dragging, but those months will be gone before you know it so you need to make sure you’re making the most of them now. I know it seems counterproductive to plan some time to do some educational activities especially when I’m trying to have a laid back summer. But we use the extra time together to help them continue to educate themselves. When I was a kid I was of the school of thought that when summer came we didn’t touch a school book for three whole months. I read fiction for fun, but I never really worked on continuing to educate myself. It wasn’t until I was older that I realized it’s the perfect time to continue to learn new and exciting things. So this is why our kids have time during the week where we continue to work on math, reading and writing. They actually like doing workbooks and learning activities a couple of times a week because it doesn’t seem like such a chore or like “school”. Summer is a great opportunity to do all the things you don’t get to do throughout the year. It’s also a great time to try out next and exciting things since you have more time and less time restrictions. Do you have any must try activities for your kids during the summer months? What are your favorite things to do with your kids? I am thinking of surprising my child with a bike… but floored by the glut of options and specifications. My kid is big for his age (6). Any tips? I would definitely get a bike for him to grow into. We generally buy bikes that have 20″ wheels when our children are around 6/7 years old. Taking him to the store with you to sit on a few and find the right one will be helpful too. Thanks Jami! I was thinking surprising him with one which explains the struggle. 🙁 I found this guide and it did help me and was able to place an order.